Doesn’t this salmon look amazing? Believe me, it tastes as tender and juicy as it looks! That is because it has been cooked sous-vide at 43C/109F. What makes this dish even more mouth-watering, is that the salmon has been cooked and then seared with Thai green curry paste, freshly made from scratch. It is served atop stir-fried bok choy with the same curry paste and some steamed Jasmin rice. It really is worth to make your own Thai curry paste from scratch. If you have a blender it is a breeze to make. Finding the ingredients may be more challenging, depending on your location. Making it from scratch will make it so much more fragrant. And you get to decide how hot it will be. Most store-bought curry paste is so hot that you can only use a little. When you make it yourself, you can go easy on the chilli peppers and add more of the ingredients that make it so delicious. Like galangal, lime zest, and coriander/cilantro root. If you do want to use store-bought curry paste to make this dish, you may have to reduce the amount or ‘dilute’ it by blending it with galangal, shallots and garlic. 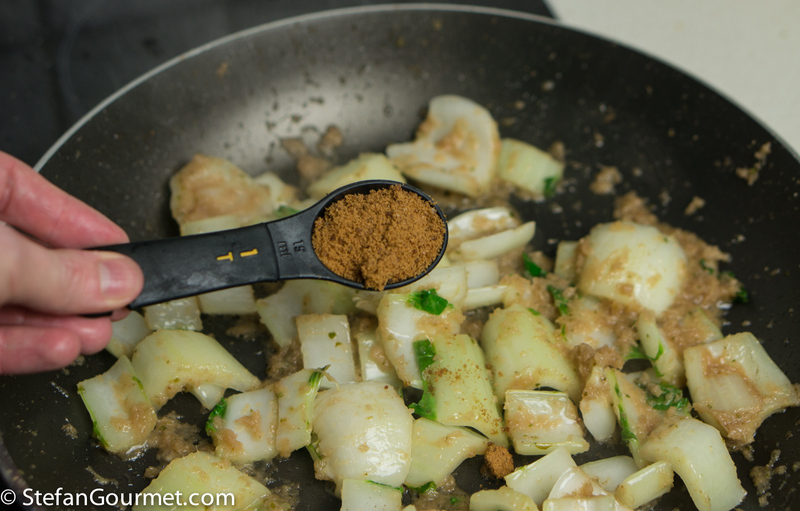 You may also wish to add ground cumin and ground coriander if you don’t see them listed as ingredients. As you can see in the ingredient shot, I only used 3 green chillies to make 8 Tbsp of curry paste. They are “Thai bird” chillies, which are very hot. The photo includes the ingredients I used for making Thai green curry paste from scratch: galangal, lime zest, lime leaves, shallots, garlic, cilantro/coriander root, green chillies, lemongrass, shrimp paste, ground cumin, ground coriander, white pepper, and salt. 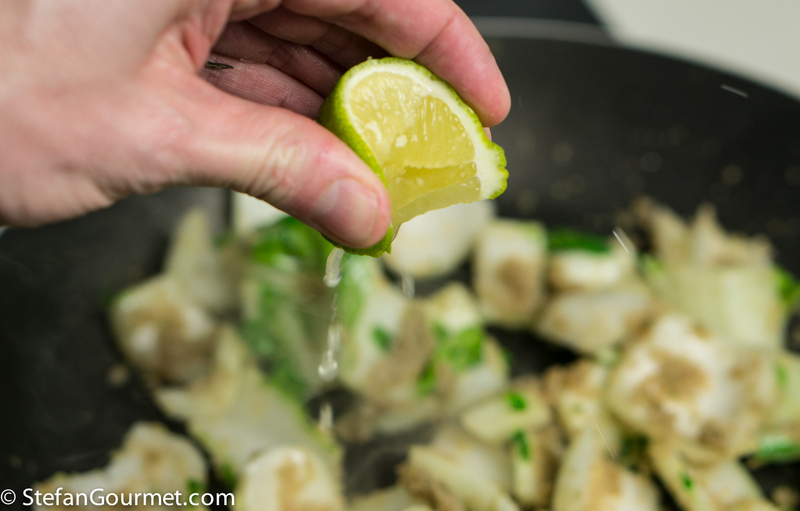 Prepare the Thai green curry paste using my recipe. This will make more than you need, so either scale down the quantities or save it for another dish. Prepare the rice. I use a rice cooker for this, which means just putting 2/3 cups of rice in the cooker with 1 cup of water and turning the rice cooker on. I prefer to prepare this dish in a non-stick frying pan, as you can’t sear the salmon in a wok. 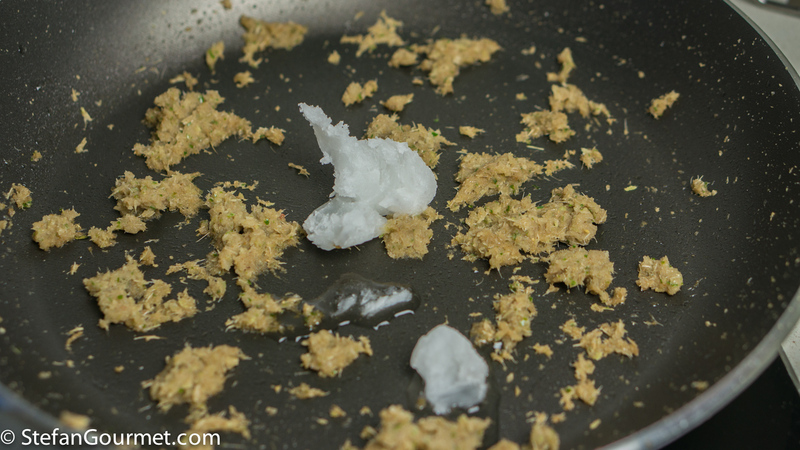 Melt a tablespoon of coconut oil in the frying pan and add the curry paste. Stir fry the curry paste for a couple of minutes, then turn off the heat and allow it to cool somewhat. Cooking the curry paste before adding it to the salmon is important as the low temperature used for cooking the salmon will not cook the curry paste. Stir frying will bring out the flavors and fragrance of the shallots, garlic, and galangal, and will make it easier to digest them as well. Rinse the salmon fillets under cold running water and pat them dry with paper towels. Season them lightly with salt on both sides. 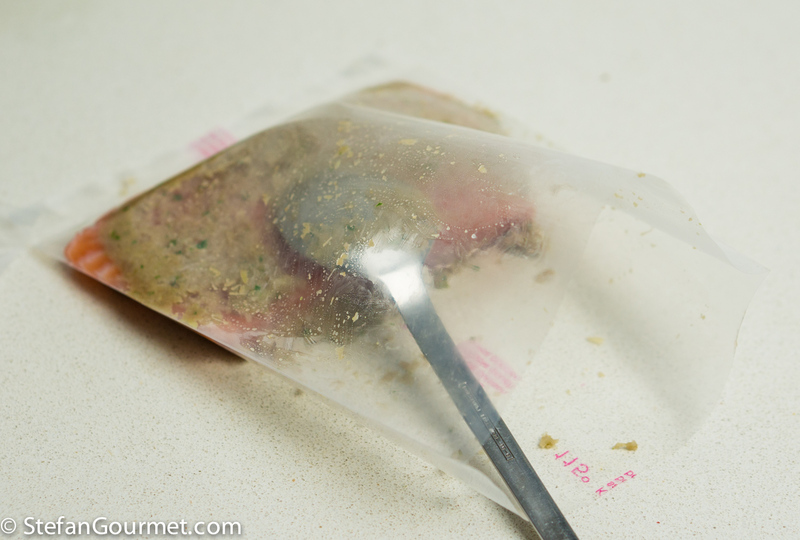 Put the salmon fillets into individual sous-vide pouches. Rub about a tablespoon of curry paste on each side of the salmon fillets in the bags. 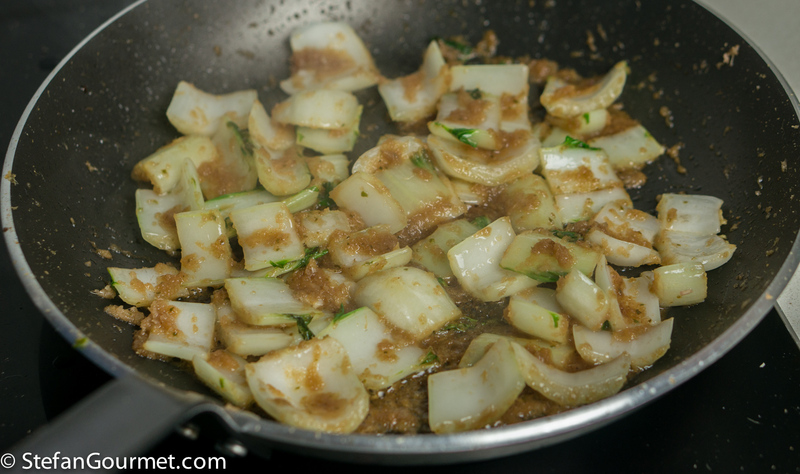 For this you will need about half of the stir-fried curry paste. 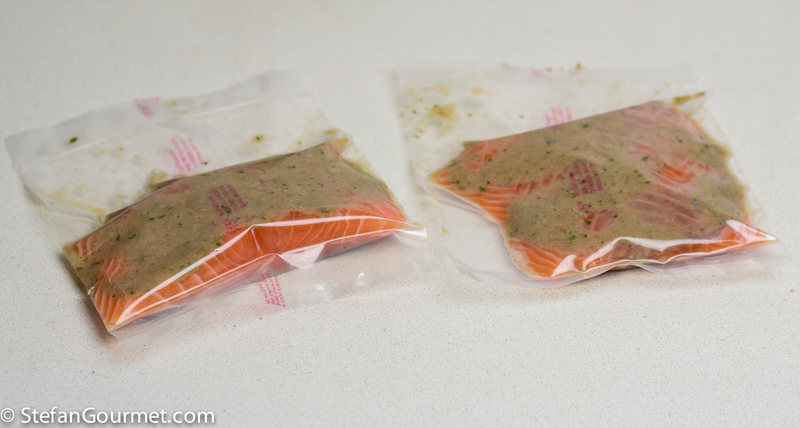 Vacuum seal the salmon fillets with the curry paste. 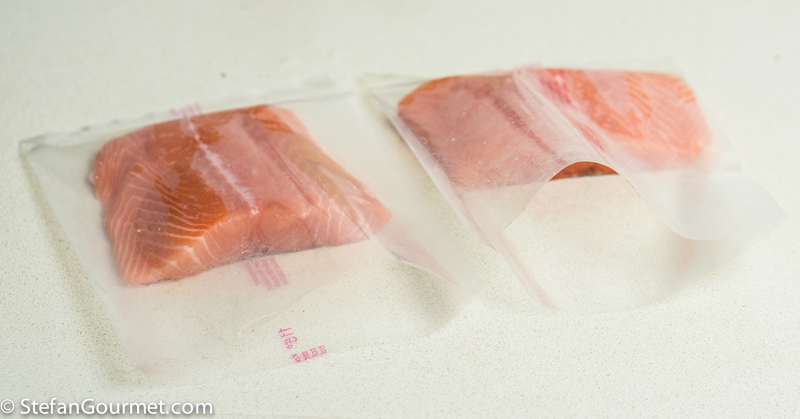 Cook sous-vide for 20-30 minutes at 43C/109F, depending on the thickness of the salmon fillets. Meanwhile, add a tablespoon of coconut oil to the curry paste remaining in the frying pan (there should be about 4 tablespoons) and turn the heat back on. 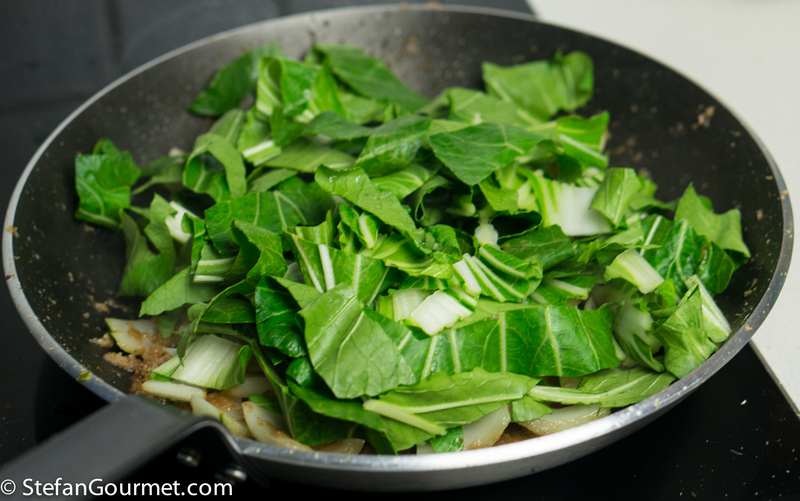 Add the bok choy stems, as they a longer time to cook. Stir fry them for a couple of minutes until they are coated with the curry paste. …and a tablespoon of palm sugar. 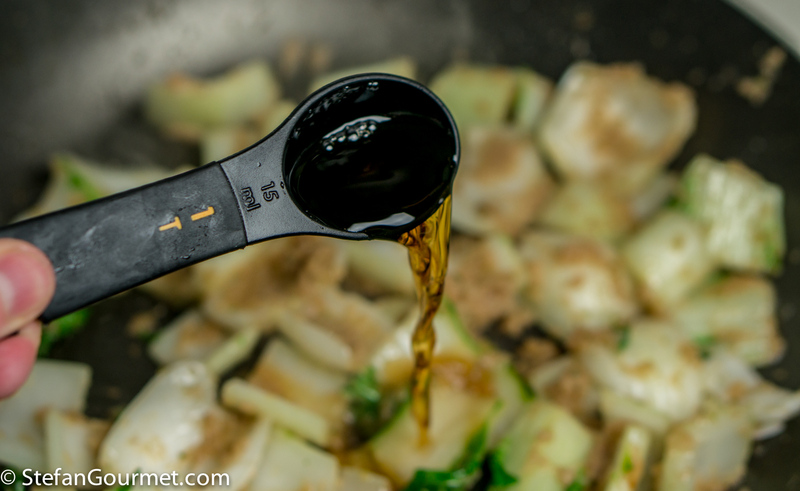 Keep stirring until the bok choy stems are starting to become tender. 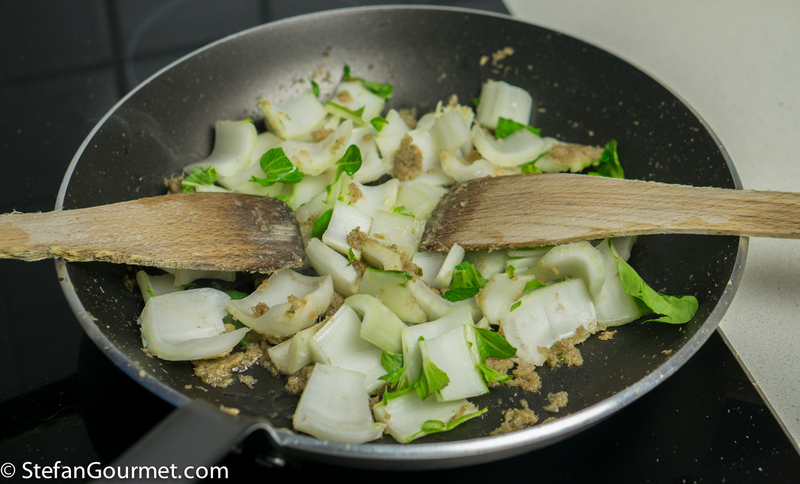 Then, add the bok choy leaves. Stir fry for another minute or so, until the leaves have wilted. 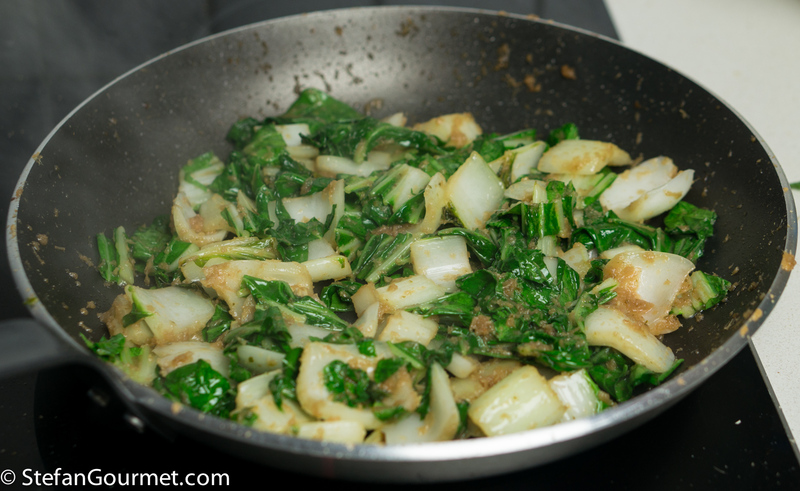 Transfer the stir fried bok choy to preheated serving plates. Carefully take the salmon out of the sous-vide pouches, so the salmon won’t break and the layer of curry paste will stay on the salmon. Sear the salmon in the non-stick frying pan, out of which you just removed the bok choy, over high heat for about 30 seconds per side. Make sure to turn it carefully with a large flat spatula, as it will otherwise break. 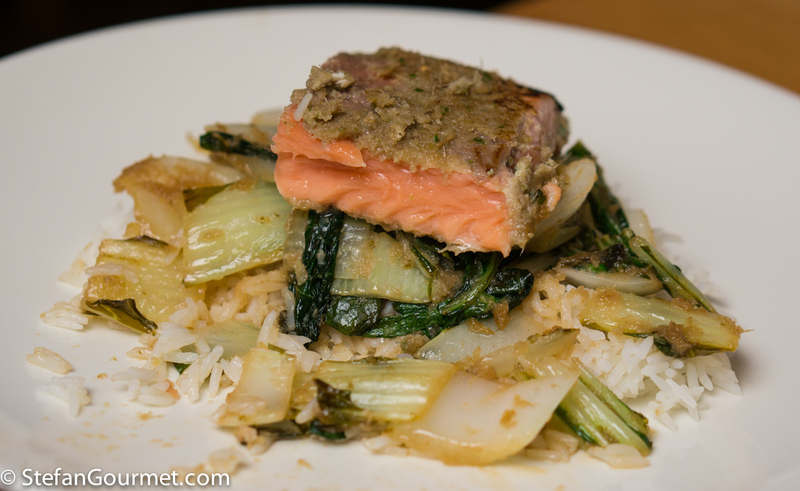 Serve the salmon with the bok choy and rice. The best pairing for this is a ligher style off-dry gewurztraminer from Alsace. Unfortunately, producers in Alsace do not provide a lot of information on the labels, so you may have to try a few bottles before finding one that is not too sweet or has too much body. Rabbit loin saltimbocca is an original delicious way to prepare rabbit loin with prosciutto and sage. The loin is the most tender piece of rabbit that will be tender and juicy when you cook it briefly over high heat. Grazie, Bea. If you cook the salmon in the oven at 120 degrees until a core temperature of 43 degrees (do you have a thermometer with a probe? ), you will be able to get a similar result without using sous-vide equipment. Stefan sei eccezionale! Ecco cosa potrei fare con tutte le biete che ho! Yum! Having baby bok choi and rice for lunch in about 10 minutes, but with kangaroo meatballs 🙂 ! You are a better cook by far than I: usually buy both my green and red Thai pastes tho’ we would have a lot more choices than you. To make salmon King one would have to keep the paste milder than normal . . . yes, well, I learned at 20-something to eat my Thai curries so hot that a spice ‘blush’ would inevitably appear: must admit still like them that way 🙂 !! I do love salmon, this looks very tasty indeed! Another winner from Stefan’s kitchen. There is so much to love about this dish. You’re right. That piece of salmon looks amazing. Well done, my friend. The Sous Vide in the title was enough to interest me in trying this. When searing the cooked salmon it was a little difficult preventing any flaking especially when turning it. Some of the curry paste remained in the bottom of the pan. Is it really necessary to sear both sides? 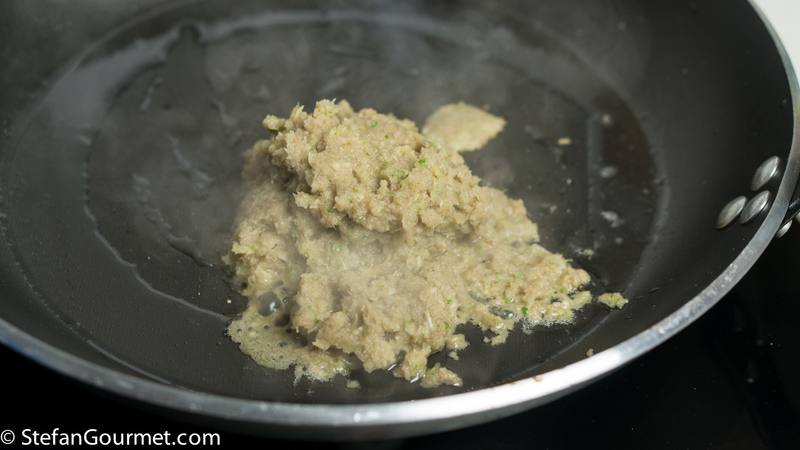 It isn’t absolutely necessary to sear both sides, as the curry paste is already cooked. However it does help to serve the salmon at a slightly higher temperature. 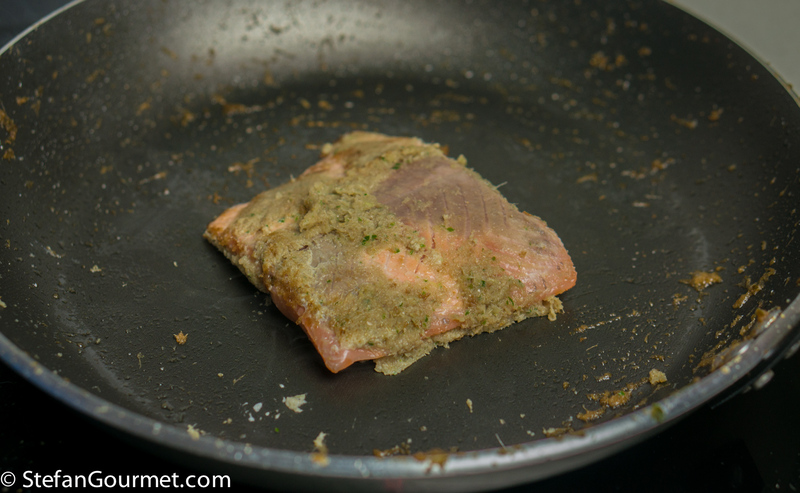 With a good non-stick pan and enough oil, it shouldn’t flake (unless the salmon is already falling apart, but that usually only happens when cooked sous-vide for more than 30 minutes). i really like reading your blog, amazing recipes! I love salmon and have noticed when making it sous vide, except adding a little salt brining it before cooking sous vide even leads to a much better result. It prohibts the creation of the white stuff (sorry dont know the correct term 🙂 ), leading to a better texture and avoiding it to break easily.